This is another in the series from My Kitchen Table, offering good-value volumes of easy-to-make recipes, and in the case of 100 Cakes and Bakes those recipes have been penned by none other than the queen of cakes, Mary Berry, who has inspired a generation of would-be home bakers. We have a royal wedding approaching and it seems the whole country is being tempted back to traditional foods, and afternoon tea is more popular than ever. There can be nothing wrong with several tiers of cupcakes, lemon slices and Madeira cake …unless it’s being served at a table other than your own. We have perfected afternoon tea, and it is the envy of other nations. Tourists feel that their trip is not complete until they have had several hefty helpings of delicious baked goods and a pot or two of Earl Grey (I would personally choose English Breakfast or another un-perfumed black tea). But we can make those dainties at home and our mothers and grandmothers always did. Mary presents classic cakes, from the ubiquitous cupcakes (remember when they were called fairy cakes?) to Victorian Christmas Cake, along with some savouries such as Cheese and Olive Scones. Small cakes, tray cakes and cakes to slice are all included. There are many old favourites as well as some trendy treats. To be a successful baker one must have a good recipe. There is a degree of chemistry involved in baking a well-risen sponge. One needs to weigh the ingredients carefully and follow the instructions. The results will give you more satisfaction than making a spag bol or a roast chicken. There are a few skills to master but they are simple and will serve you well. Your family and friends will be impressed by the end-results. 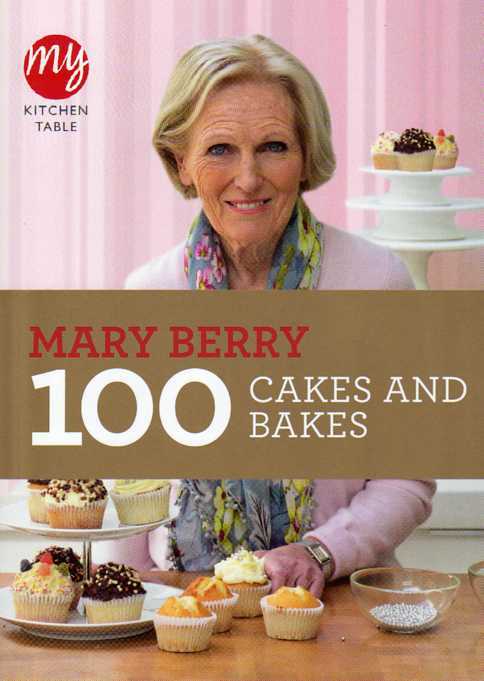 I have many ‘pick of the book’ choices from 100 Cakes and Bakes. Seed Cake is traditional and old-fashioned, and was indeed one of my Dad’s favourites. It’s very rare to find this in a cake shop or on a restaurant cake stand. It has a distinct flavour of caraway, and is of the Marmite school of cakes – that is to say, one either loves it or hates it. It was 1966 when I tried my first slice of cheesecake. I was on holiday in Germany and enjoying all the new foods available. This wasn’t the common American style cheesecake with its biscuit base. This was the traditional version made with ricotta and sultanas, and was tangy with lemon. There is a recipe here for an Austrian Curd Cheesecake that seems a good approximation of the one I remember from all those decades ago. Not a fussy dessert but very smart. 100 Cakes and Bakes will introduce a new audience to some delightful confections. Baking is part of our culinary heritage and Britain is celebrated for it. These cakes are traditional for the most part but they are not over-taxing to make, even for the novice home cook. The recipes are bound to be reliable – they are Mary Berry’s, after all.